The TSP stock funds have been on a tear recently, rising on average between 7% and 11% over the past three months. Another development, however, points to the underlying strength of the companies that make up the S&P 500 and the C Fund. S&P Dow Jones Indices – the group that oversees the S&P 500 index – noted that the number of companies that have been paying out dividends has steadily risen since the recession. By the end of 2012, 403 of the S&P 500/C Fund companies were paying dividends, the highest number since 1999. By comparison, the number of companies paying dividends steadily decreased from the early 1980s, from 469 in 1980 to 438 in 1990. In 1999, as the late-1990s stock market bubble reached its zenith, 402 companies paid a dividend. Through the ensuing years, the number dropped as low as 351 in 2002 — at the depth of the first steep market decline. The number rose to 390 in 2007 as the market recovered only to drop again to 363 in 2009, again at the depth of the second steep market decline. 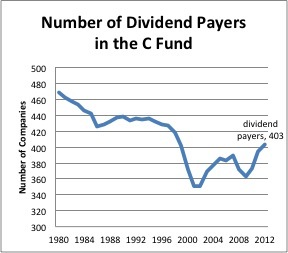 The number of dividend payers has steadily risen since then. The more companies that pay out a dividend each quarter, the higher the potential C Fund yield in aggregate, and the better the return of the fund. Hopefully, this positive trend will continue in the coming years.